APES TO MAN? Does evolution say man came from the apes, or merely that we had a common ancestor? The original question was: Why do creationists claim evolution says man came from the apes, when evolution really teaches human beings came from a common ancestor with the apes? You should be more correct in your terminology. Get it right! The term “ape” refers to gibbons, orang-utans, gorillas and chimpanzees. Despite the fact that much money and effort is invested in the genome studies of both apes and humans to show they are our closest evolutionary “cousins,” it is correct to state that modern day evolutionary theory does not teach humans are descended from any of these. The best way to answer this question to consider how apes and humans are placed on the evolutionary tree, usually with a textbook diagram like this. If evolution is a real process involving real living things, and not just diagram on a museum wall or in a textbook, then point A on the diagram should be a real creature that is the most recent common ancestor of both living apes and humans. What kind of a creature was this? Its immediate ancestor must have been a kind of ape, because it was descended from creatures that were no longer monkeys (which had evolved off the human line ages before), and it gave rise to the creatures we now call chimpanzees, which are apes. Furthermore, according to evolutionary theory, between it and human beings there are a number of extinct fossil creatures whose technical names have the formula “x-pithecus”, e.g. Ardipithecus, Australopithecus. The term pithecus is Greek for “ape”. Austral (as in Australia) means, “southern,” then Australopithecus means “southern ape”. The most famous Australopithecus is “Lucy” who is regularly proclaimed in textbooks and on television, as an ancestral link between apes and humans. On this basis it is totally consistent with evolutionary theory to call the extinct supposed common ancestor of living apes and humans an ape, as it is descended from apes and gave rise to apes, and supposedly to man. All claims that evolutionists are merely referring to a “common ancestor” between man and ape, which wasn’t an ape, and therefore creationists don’t understand the theory of evolution correctly, are shear bluster and smokescreen for their ignorance, and a distraction from the real evidence. Man, apes and monkeys: what are the differences? Answer here. Bonobo chimpanzees can walk upright all the time. 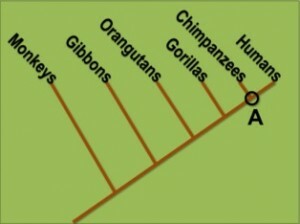 Doesn’t this prove we came from the ape family? Answer here. HOMOSEXUAL SIN: If homosexuality is sin, why isn’t it sin to eat shellfish, shave beards and work on Saturday? KETURAH is called a concubine and a wife. When did Abraham marry her and when were her children born?